Larger-than-life comic strip characters will storm the capital's major arteries. 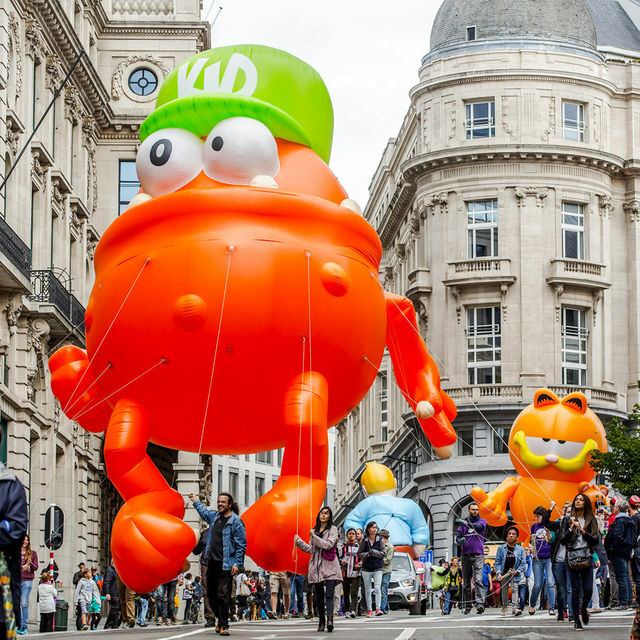 The Balloon's Day Parade is raring to go and display its gargantuan balloons to an ever-larger audience. Every year a new balloon joins the parade. This time, to celebrate the anniversary of the Smurfs, Peyo's most famous characters will be adding a burst of blue to the event! Come and watch giant balloon versions of your favourite comic book heroes being inflated on Place Royale. The join them for a walk through the streets of Brussels and watch them be deflated on the big boulevards of the city centre. The Balloon’s Day Parade is looking for volunteers to guide the parade of balloons along the route from 13:45 to 18:00. All volunteers will receive a €20 expense allowance for their help + a cap + a sandwich. The allowance will be paid out through a volunteer form that must be signed on the day or through a one-off group allowance (for Scouts, non-profit organisations, etc.). You must be at least 16 to volunteer. If you wish to register as a group, please mention the number of people, the name of your organisation or association, etc. on your registration form. For more information, contact the Balloon’s Day Parade, using the reference “BDP 2018”, at the following email address: white@beegroupe.be.